You do not want to let in Annabelle Ransomware into your Windows operating system because when this malicious infection slithers in, it messes with the MBR (Master Boot Record), and it encrypts all personal files found on the system. The threat only evades Windows system files, which is completely understandable, considering that the infection needs a fully-functional operating system to run. The dangerous threat was created to make money, and, unfortunately, it is likely to succeed if it manages to slither into the systems of gullible or desperate Windows users. Are you desperate to get the encrypted files freed? If you are, you are more likely to pay the ransom that is represented via a ransom note that is supported by the terrifying image of a character from John Leonetti’s horror movie, “Anabelle.” Hopefully, you haven't paid the ransom yet because that would be a waste of your money. Although we cannot help you with the decryption of files, we can help you remove Annabelle Ransomware. Please continue reading to learn all about the process. It is very important that you figure out how Annabelle Ransomware got into your operating system because you want to make sure that the same vulnerability or security backdoor cannot be used against you in the future. For example, if you let in this malware by opening a corrupted spam email attachment, you need to be more cautious about the emails and attachments you interact with. All in all, it is most likely that the malicious infection slithered in silently, and you did not have the opportunity to remove its launcher in time. If you do not notice and delete Annabelle Ransomware, it immediately encrypts all files, and then it blocks the Task Manager and terminates explorer.exe to ensure that you lose all control over the situation. 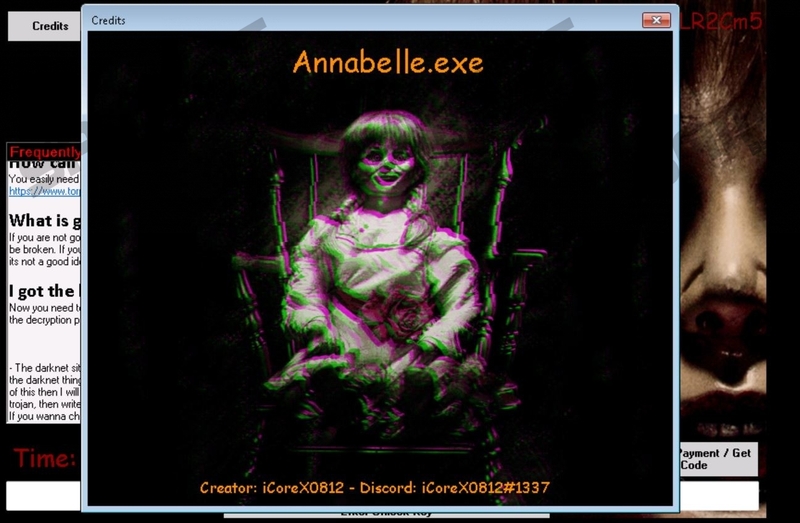 Once files are fully encrypted, the infection restarts the computer to load a window with the ransom note and the image of Annabelle. If you restart the computer again, the window is not shown again, but if the MBR is corrupted, an image representing the “Miss me ? ANNABELLE” message is shown. The ransom note supporting Annabelle Ransomware informs that you need to download the Tor Browser and visit a “special site” to pay a ransom. At the time of research, the ransom was 0.1 Bitcoin, which is roughly around $1000. Note that the Bitcoin cryptocurrency is extremely unstable, and the conversion rates shift frequently. It is alleged that you would be provided with a “personal key” if you paid the ransom, and once you obtained that, you could decrypt your files. Is this what would happen if you paid the ransom? Although the attacker behind Annabelle Ransomware might have the ability to decrypt your files, it is highly unlikely that they would bother with that. Ultimately, you cannot force cyber criminals to keep their promises, and, unfortunately, the victims of file-encrypting ransomware usually end up losing both money and personal files. To make matters worse, the MBR is corrupted too, which puts the malicious threat into the same category as MBRlock Ransomware, Mischa ransomware, GoldenEye Ransomware, and all other scary infections whose removal has been discussed many times before on this website. Do you have a Windows recovery CD/DVD? If you do, you might be able to repair the MBR yourself; however, if that is not the case, you will need to bring in someone more experienced. The instructions below show how to do that. Afterward, you will need to find and delete Annabelle Ransomware, which might be very complicated as well. Unfortunately, we cannot give you instructions on that because the location of the launcher – and even its name – is random. After you repair the MBR, we recommend installing anti-malware software. You should do that to have Annabelle Ransomware erased automatically, and also to have the operating system protected. Clearly, you need the protection to keep malicious threats away, and, hopefully, if you install the right security software, you will not need to worry about this again. Another thing you should take care of is your personal files. Back them up to ensure they are safe. Insert the Windows recovery CD/DVD. When the menu appears, select the preferred installation settings and then click Next. Click Repair your computer and then choose Command Prompt. Windows 10/8 users can find access to Command Prompt via the Troubleshooting menu. Eject the CD/DVD then type exit and tap Enter. Restart the computer and then install a reliable anti-malware program to erase the ransomware. Press any key when you are shown the Press any key to boot from CD alert. Tap R when the Welcome to Setup menu shows up. Enter 1 when the Which Windows installation would you like to log onto message shows up. Enter the password when the Type the Administrator password message shows up. Type fixmbr and then tap Enter (this is when the MBR will be fixed). Quick & tested solution for Annabelle Ransomware removal.